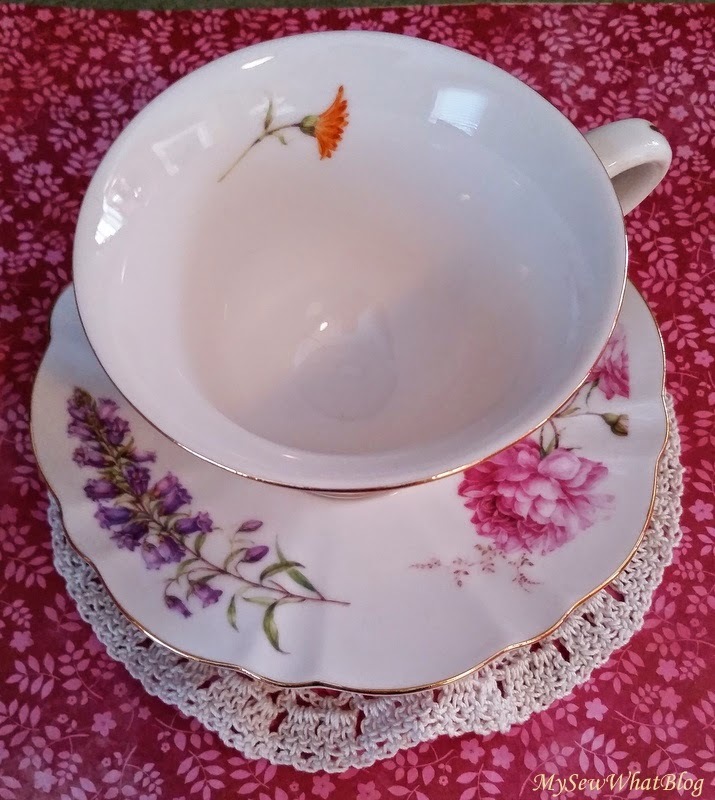 Stephanie's Teacup Exchange--My Cup of Tea! I arrived home two weeks ago today and found this delightful package waiting for me! 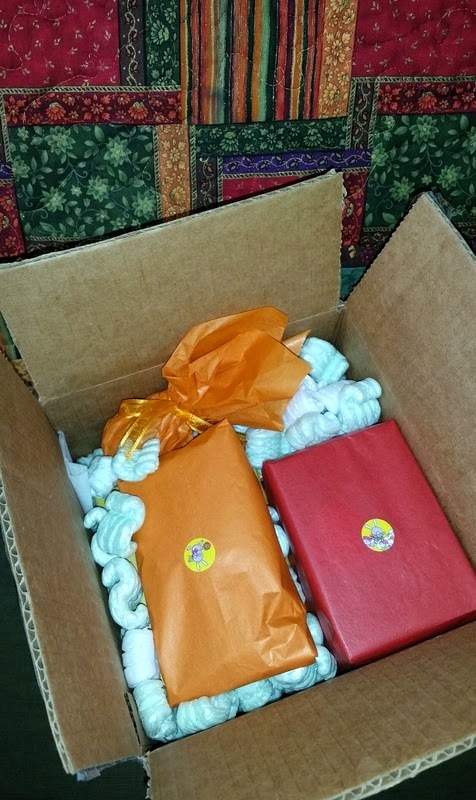 I sat it on my sofa, opened the box and the gifts inside were wrapped up in my favorite autumn colors! Notice how it coordinates with the quilt on the back of my couch? The little stickers are Easter themed and very sweet! 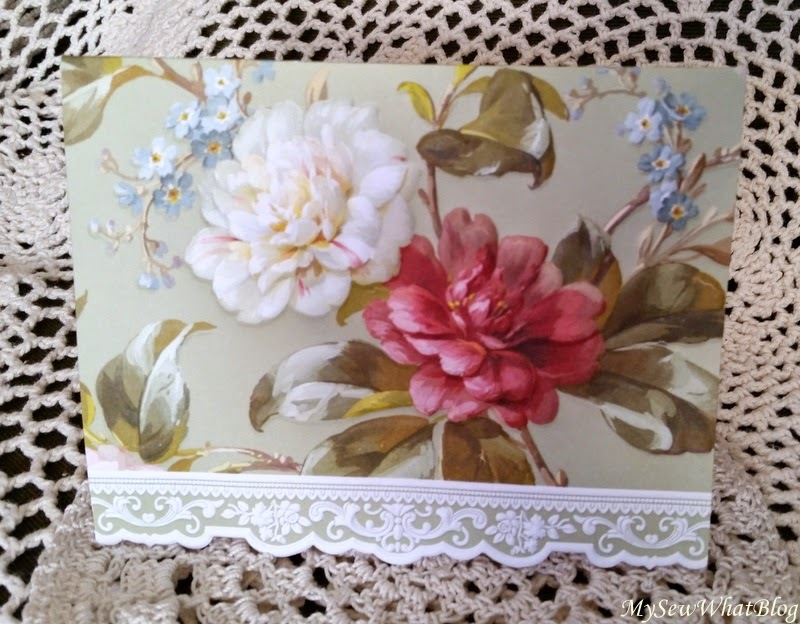 The first thing I opened was this lovely card from Karren who blogs over at Oh! My Heartsie. Please pay her blog a visit and leave her a comment. Tell her I sent you!!!! Despite some challenges that she was faced with during the swap, she still put the nicest package together and shipped it off to me. 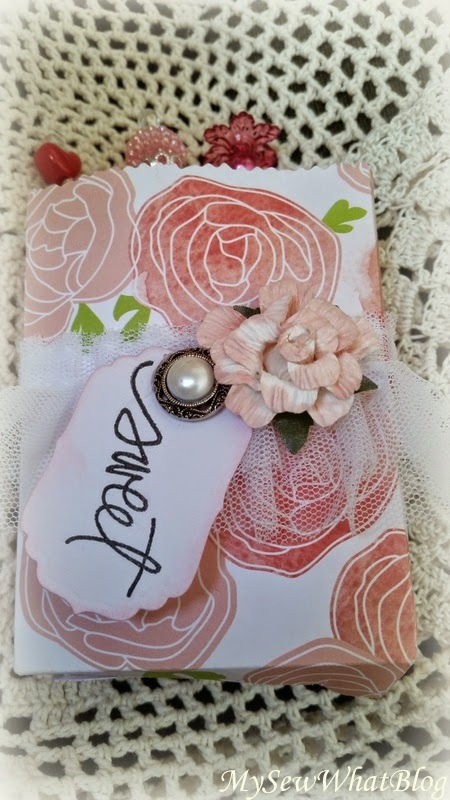 It was wrapped with loving care, a sticker on each little gift.....To think that she was able to do all of this during a difficult time made it extra special. It is so appreciated Karren! Thank you very much! Next I opened this sweet little gift bag that contained a trio of stickpins. They are so pretty. Opening all of these gifts was reminiscent of opening my Easter Basket as a youngster. Easter Bunny used to leave us a combination of candy and special little gifts. Oh what fun! 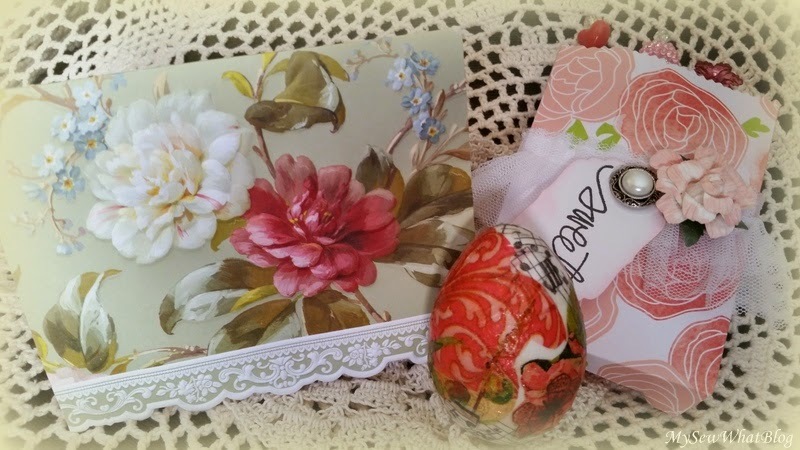 My next surprise was the little decoupaged Easter egg! It was the cutest thing! Here is my beautiful mug! I love it Karren! Thank you! I love the flowers! No matter which way you turn it, it is perfectly lovely! You will note the ecru doily underneath. It was also included in my package of goodies! I collect doilies and this ecru doily is delicate and dainty! I already cheated and used it in at least one earlier post! ......there are more little treasures! The little package of mini eggs did not last very long! I received note cards, a notepad and some cute little Easter tags. Hiding in the back is delicious Earl Grey tea! After opening all of my gifts, I made myself a cup of tea in my brand new cup! It was especially delicious! 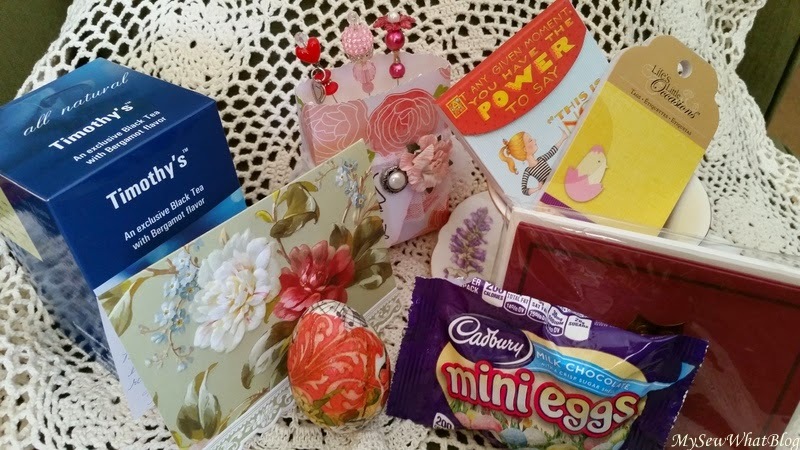 Karren, I can't thank you enough for sending me such a lovely package full of sweet little surprises! The package was thoughtfully wrapped and a complete joy to open!......just like my Easter baskets when I was small. It is wonderful to feel that kind of youthful, even silly joy as an adult. I will cherish each and every item you chose for me Karren! 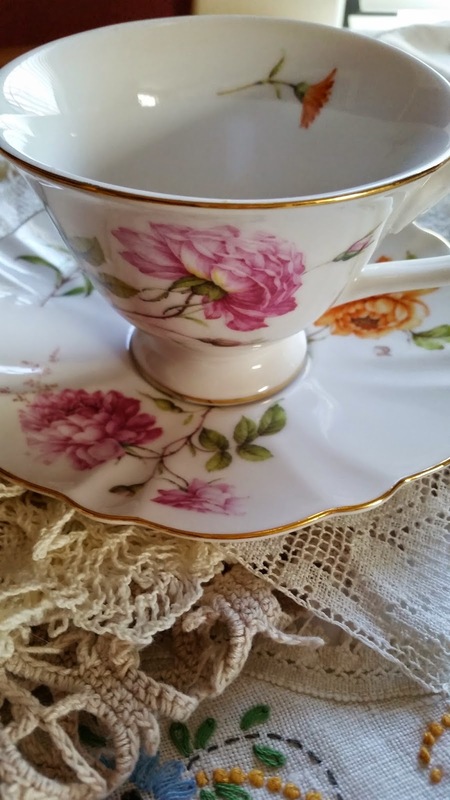 I am so happy to have met you through Stephanie's Teacup Exchange and look forward to reading more of your blog! 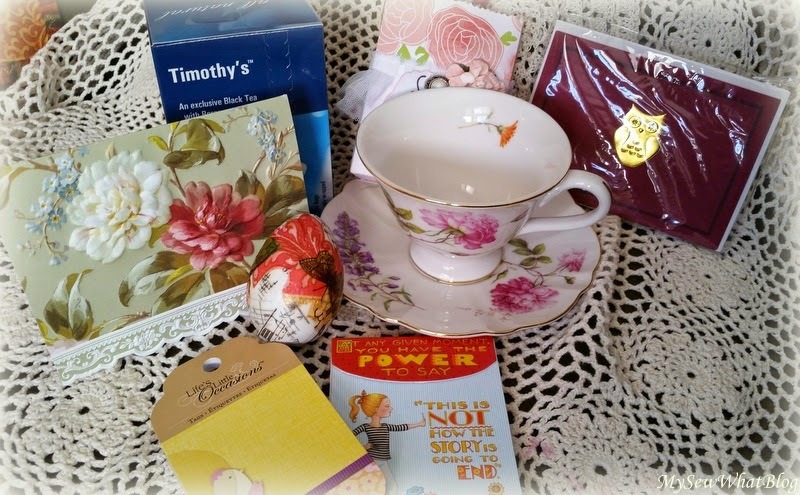 The recipient of my teacup package was Debbie Harris. 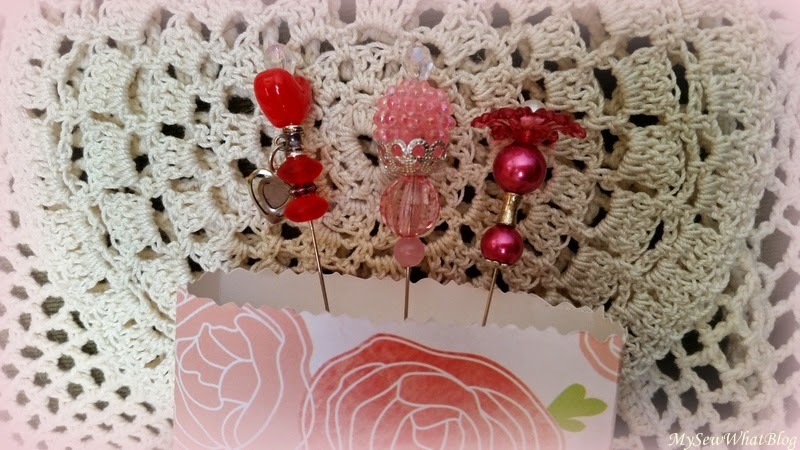 She blogs over at She Graces Her Home in God's Beauty! Over the past year I have enjoyed getting to know her through her kind, supportive comments and her posts! She makes me laugh out loud and she has brought a tear or two to my eye. Her posts are inspirational and they have encouraged me on more than one occasion. The lovely music she has on her blog just completes the experience! I don't know how many of us participated this time, but I believe the last swap had 60 participants! She is definitely a hostess with the mostess! If anyone has doubts that one person can make a difference, visit Stephanie's blog (which provides links to all of the participants and their stories) and judge for yourself! The pure joy and wonder we grown ups experience from both the giving and receiving of these gifts is genuinely heartwarming! Stephanie, we are so blessed to have you in our midst! THANK YOU!